I am the proud mama of three boys. Let me tell you....finding scrapbooking products that appeal to ME and are still doable for those rough & tough photos is a chore. Can anyone relate? :) I was so excited to see the Lost & Found Two Breeze collection by My Mind's Eye. It not only captures the soft and pretty that I love but also is in a color scheme that is still masculine. Ease of Use: The great variety of product in the collection gets those inspirational juices flowing: layered stickers chipboard, decorative brads, pom poms trim, pearl swirls, various titles, buttons, label stickers, stamps and luscious glittered paper. It has it all! Construction/Durability: The stamped paper is of the perfect thickness, easy to trim but sturdy enough to be a base. The products are well made, even the layered stickers stayed together. 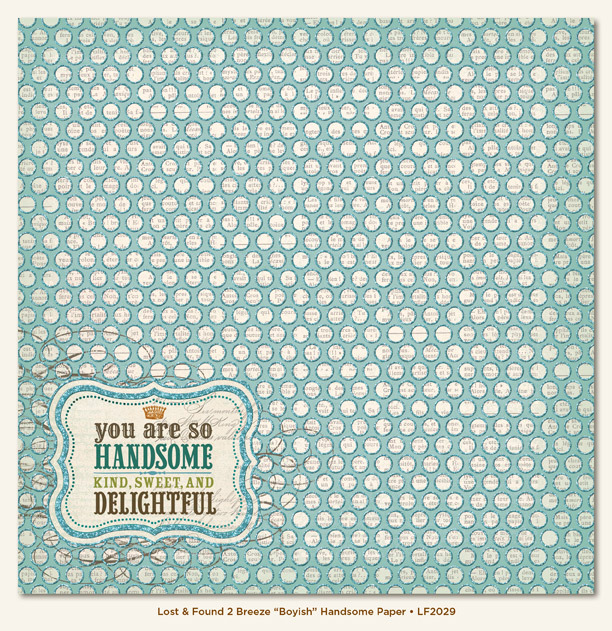 Usefulness: The collection is suitable for cards or layouts and would be perfect for mini albums showing off my 'sweet' boys. Cost Effectiveness: The prices are reasonable, especially considering the quality of the product. -I loved the layered chipboard. It is embellished and ready to use. -I also liked the acrylic stamps in the collection. The images lend themselves to both cards and scrapping. -I would have liked if the pom pom trim was slightly smaller. 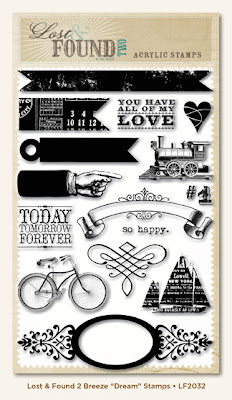 -Some coordinating dimensional alphabet stickers would finish off the collection perfectly, don't you think? -I wish the paper had a bit less glitter. I ended up wearing it around all day. Ahh..the hazards of crafting. Bottom Line: This is the PERFECT line for me and my testosterone-filled home. What do you think? Can glitter be masculine? Leave us a comment including your email address by midnight PST Wednesday to be entered to win a My Mind's Eye prize pack. U.S. residents only. I agree much easier to find things for girls - have to be flexible and adapt! this may do the trick! I love the colors in this. I am thinking besides using it for men maybe using it for older pictures. I love that package of stamps...so many possibilities there. I definitely have a hard time finding the right paper for boy layouts. Thank you for reviewing this line! I will definitely check it out! Honestly I've never tried to put glitter on my boy's page...But maybe that's because I hadn't seen this MME before! The glitter here is both elegant AND masculine. Love your page and card that you've made - just classic. Perfect colors, MME impresses every time! Love the colors in the Breeze line! oh yes, I think if you can find the right colors and manipulate how much glitter there is you can make it work for masculine. Also depends on the pic. Love the pics of this line. MME is always a favorite and this line is no different. Love the blues! I love these lines and using glitter on guy pages doesn't bug me at all. It does however, bug my DH when he ends up with glitter all over him! LOL! Glitter can be masculine IMO! Love your projects! Love it...and yes, glitter can definitely be masculine (well, not on the face though...ha ha!). I love the blue and green shades! I'm using blues/greens for my daughters' pages because they're tweens and currently dislike anything pink. Prior to seeing this line I would say no, but now I think...ummm, yeah, glitter can be masculine! This is a gorgeous line that I would love to try! 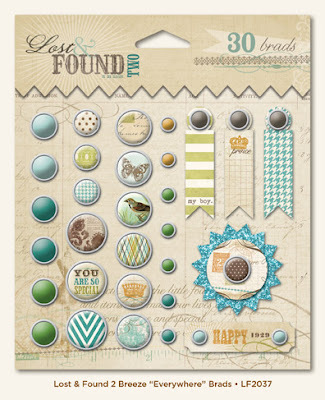 Especially love the stamp set! Thanks so much for the inspiring projects! I can't imagine using glitter on a masculine page. A baby page is different however b/c the main idea is baby, not masculine. yes it can be masculine! love the colors and stamps. Oh yes...the glitter would be fine for masculine projects! I LOVE the stamp set and the blue tones! Love that collection and yes, glitter can be masculine! I love what you created with the new goodies! Fabulous! Glitter for men...not so much. Babies yes, but not the average man. I especially love that new stampset! Thanks for the peak at the newest designs! I have a few pieces of this and yes, glitter can be masculine. I used it and made a one page layout for my son and was so happy with the results, would love to have some more of it! I love that this line from MME has glitter on the masculine pages--I think it's totally masculine (you just need to use it in a way that portrays that masculine theme). LOVE this line--and I LOVE your creations!!! This is another amazing collection by My Mind's Eye. I would LOVE to own more of the items from it!! I adore the Lost and Found collections from MME. I usually wait for a sale to buy my crafty stuff but these papers have inspired me to pay full price!!! not sure about the glitter, but i do like the masculine colors in this line. My Mind's Eye collections continue to impress me! LOVE this!! Love this. 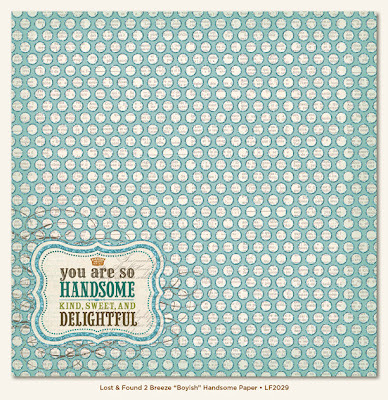 especially the blue polka dot glitter paper and the cute clear stamps! Definitely it can be!!! Love MME and thanks for the chance! Awesome sentiment on the paper. I love MME! They have a little something for everyone. I have no boys (other than my husband) but still gravitate towards the blue papers. I'm with you, though. That glitter sticks all over my clothes.